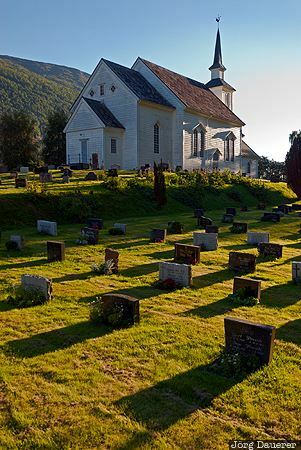 Nedstryn church and its graveyard back-lit by warm evening light near Stryn. Stryn is in Sogn of Fjordane in central Norway. This photo was taken in the evening of a sunny day in September of 2010. This photo was taken with a digital camera.